In March 2001, the Names Project AIDS Memorial Quilt left San Francisco for its new home in Atlanta, Georgia. 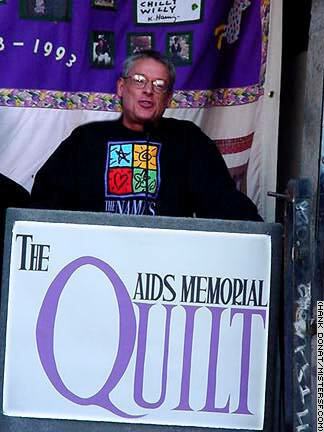 Invented by activist Cleve Jones in 1985, the quilt became a 54-ton weapon in the fight against AIDS. As the epidemic grew in the '80s, nothing personalized the toll of the disease for a global audience like the panels of the quilt, each fashioned by loved ones in memory of someone who died from AIDS. At emotional farewell ceremonies here, Jones said he was gratified that the quilt would be based in Atlanta, where it can be used to educate African-American communities and others that are being particularly hard hit with new HIV infections. Emphasizing that the war against AIDS is a political one as much a health crisis, Jones denounced governments for allowing the disease to infect 40 million people world-wide as AIDS enters its third decade. Jones, Congresswoman Nancy Pelosi, Supervisor Mark Leno, District Attorney Terrence Hallinan and others folded the final section of the quilt to be loaded onto a moving van. Each spoke of people they loved who were lost to AIDS, from friends and lovers, to brothers and sisters, even the flower girl at Pelosi's wedding. Many of the original volunteers who created panels for the quilt were on hand to say good-bye.